At no time in modern history have so many people been on the move as at present. Migration facilitates critical social, economic, and humanitarian linkages. But it may also challenge prevailing notions of bounded political communities, of security, and of international law. 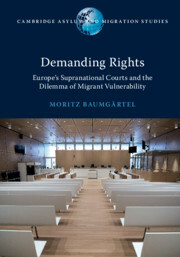 The political and legal systems that regulate the transborder movement of persons were largely devised in the mid-twentieth century, and are showing the strains. New challenges have arisen for policymakers, advocates, and decision-makers that require the adaptation and evolution of traditional models to meet emerging imperatives. This new series aims to be a forum for innovative writing on all aspects of the transitional movement of people. It publishes single or coauthored works that may be legal, political, or cross-disciplinary in nature.